At Blaisdell Family Dentistry, we enjoy helping patients achieve optimum oral health in Nampa. Today’s article focuses on something that doesn’t get as much attention as cavities or cosmetic dentistry. What we’re referring to is your sense of taste. A healthy mouth is not only a happy mouth but also a mouth that can enjoy the flavors of all types of foods. Healthy oral habits benefit our taste buds as well as our smiles. Here are some tips to help you better enjoy all the flavors and textures that make each meal a delight. 1) Treat dry mouth. Dry mouth can create a loss of taste sensitivity, so it should be treated quickly by your dentist. Dry mouth can also be detrimental to oral health in Nampa. Without a normal amount of saliva in the mouth, your smile can be susceptible to cavities and gum disease. 2) Avoid processed foods with fake flavors and too much sugar and salt. They will quickly desensitize you to more subtle, healthy flavors. 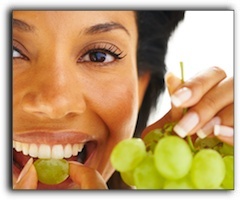 Fresh meals and organic foods might be a better alternative for your oral health in Nampa. 3) Don’t smoke! Cigarettes are bad for a host of reasons, but many men and women don’t realize that their sense of taste is dulled when they smoke. Olfactory nerves can even be damaged, permanently affecting your sense of taste and oral health in Nampa. Thank you so much for visiting our blog. Along with strong teeth and taste buds, we want our patients to have the beautiful smiles they have always desired. If you have any questions regarding cosmetic dentistry such as oral conscious sedation, dental implants, or teeth whitening, please contact us today to schedule your consultation.